Demilitarization Zone in Northern Syria: What Is Going On in the Idlib Hornet Nest? The creation of demilitarisation zone in northern Syria was announced last week. The joint decision of Moscow and Ankara was supported among a number of pro-Turkish groups. However, Hayat Tahrir al-Sham (HTS), Huras al-Din, and the Turkistan Islamic Party armed groups have rejected the Idlib agreement. While the parties that have agreed are trying to prevent a humanitarian catastrophe, the terrorists seek to seize the ‘last opportunity’ to earn some money. Their fate has already been determined, and they would need significant resources to take shelter in Turkey. Therefore, slavery, drug smuggling as well as trafficking of artefacts is still flourishing in the province. The same method is used by HTS for the illegal sale of human organs to the European continent. The locals who refuse to join the ranks of the terrorists are being kidnapped and smuggled to the Turkish towns of Antioch and Kiliss. The illegal surgery on the transplantation of donor organs [source to be confirmed] under the auspices of the Turkish officials is being carried out there. Besides, the radicals trade artefacts, are still in high demand among collectors around the world. During the Syrian war, they plundered hundreds of historical and cultural sights and turned the ancient town of Sarmada, located not far from Turkey into a black market. 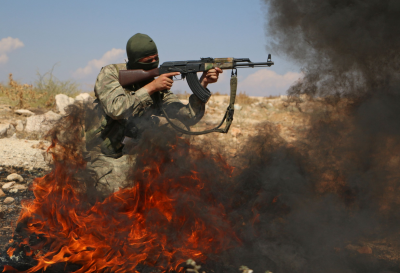 Within the framework of creating the demilitarisation zone, mechanisms are envisaged to suppress the financing of militants in Idlib province. In turn, the Syrian Arab Army initiated a large-scale liberation operation. The government forces started patrolling the nearby areas in the southeast of the province for further creation of humanitarian corridors. After being interrogated, the captive said that he had been fought in the ranks of HTS in a unit of 300 fighters. “I was trained in a camp near Saraqib along with my brothers for committing single terrorist attacks. I was quite impressed to see the White Helmets activists being trained there too”, Abu Yahya added. The HTS field commanders make every effort for setting up a defense position. By oppressing the locals and smuggling, the terrorists earn a big sum of money and recruit new fighters under the black banners. The longer Idlib matter is being resolved; what is more difficult is the restoration of control over the region for the Syrian army. It’s quite difficult to establish how the situation will be developed in Idlib as Russia and Turkey have entirely different interests in Syria. However, the results of their efforts should turn into the elimination of Idlib hornet’s nest.